Welcome one and all to a huge installment of the NXT Spotlight here at TJRWrestling. We have two main event and Takeover level matches on this week’s episode. 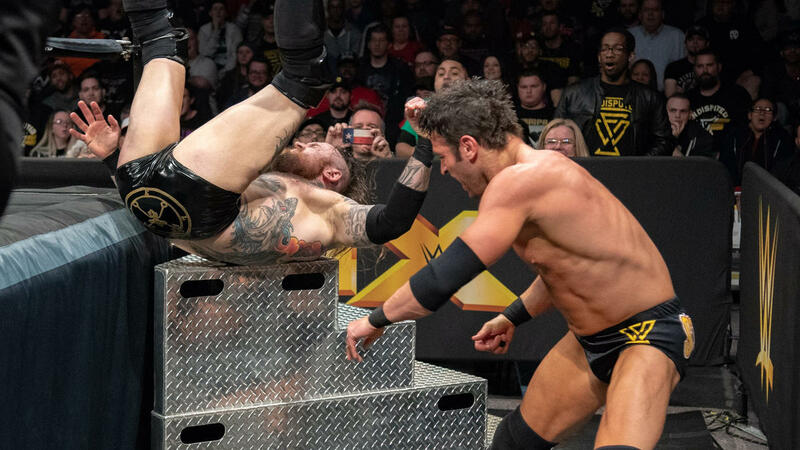 Aleister Black faces off against Roderick Strong, and Johnny Gargano has his first North American Title defense against The Velveteen Dream. There’s obviously a lot of buzz around Black and Gargano after this week’s main roster shows, so let’s not waste any time in seeing what they’ve got in store for Full Sail. Roddy with a double leg takedown to start and then a go behind into an arm bar. Black out quickly and then drops Roddy with a shoulder tackle. Multiple kicks and then a running knee by Black. Back elbow and then a bridging German suplex by Black gets the first two count. Black charges Roddy in the ropes, but Roddy dumps him to the floor. Roddy then with a wrecking ball dropkick. Roddy goes to the floor and then does a backbreaker over the steel steps on Black before throwing him back in the ring. Standard backbreaker in the ring by Roddy. Roddy tries for a cradle pin, but Black’s shoulders aren’t on the mat, so Roddy turns it into a front face lock. Black escapes but gets whipped hard into the turnbuckles and then gets a basement dropkick to the face by Roddy, which sends Black back to the floor. Roddy rams Black’s back into the apron before throwing him back in. Roddy props Black on the top rope and struggles to get a top rope superplex, almost slipping a couple times, before Black is able to slide out. Black tries a powerbomb but Roddy escapes and hits another backbreaker for a two count. Roddy goes for a suplex but Black knees Roddy in the head. Black goes to the corner and Roddy misses a knee strike there. Black coming back with his kicks and then a standing Lionsault. Roddy avoids a roll up, but Black kicks him in the head and nails a brainbuster for a two count. Black lifts Roddy up by the boot for Black Mass, but Roddy falls into the ropes to avoid it. Two kicks by Roddy and then a pop up gutbuster. Black comes right back with a jumping knee though. Roddy goes to the floor and Black tries a Golden Triangle moonsault but Roddy cuts him off on the apron. Roddy gets Black up in the torture rack and then just tosses him back first onto the top turnbuckle. He rolls Black in and gets a two count. Black fighting out of the Strong Hold but gets caught with a jumping knee in the corner. Roddy with his reverse belly to back suplex for a two count. Black escapes from a suplex again and Roddy turns right into Black Mass, and that’s it for him. It went about 9 minutes. Post match, here comes the rest of Undisputed Era. O’Reilly gets laid out with Black Mass immediately, but Cole and Fish are able to take him down. Ricochet now comes down and helps to even the sides a bit as he and Black are able to clear the ring. K-Tank’s Take: A hard-hitting affair as you would expect. Good action for the time given. I feel like Undisputed Era is being put on the back burner a little bit, especially Adam Cole. But if the four that were on main roster TV this week are gone in a couple months, I think they’ll get another hard push at that point. It is a little weird that Cole gets left behind, but it is what it is. Perhaps him and Dream can be a long term feud for the brand after WrestleMania. We see last week’s confrontation between the Four Horsewomen and Mia Yim and other PC recruits in the locker room. We get a video package for Bianca Belair recapping her issues with Io Sharai defeating Shayna Baszler a couple weeks ago. After a recap of what DIY, Ricochet, & Aleister Black did on Raw and Smackdown this week, we see that the Dusty Rhodes Tag Team Classic will return in two weeks. The winner gets a tag title shot against War Raiders at Takeover: New York. The first four teams announced are Street Profits, Forgotten Sons, Undisputed Era, & Fabian Aichner/Marthel Barcel. The other 4 teams will be announced next week. Shake of hands for sportsmanship to start off. Strong tie up that neither woman can break. Now multiple reverses until Mia gets a front face lock, but Xia gets the ropes. Clean break. Mia gets a wrist lock. Xia escapes and sends a flurry of kicks towards Mia, but she’s able to get to the ropes without getting hit and another clean break. Mia now wants a test of strength and is able to get Xia down in a pinning predictament. Xia escapes and then jumps up on Mia and surprises her with a sunset flip for a two count. Strong kick to the chest of Mia. Xia goes to top rope and Mia moves out of the way. 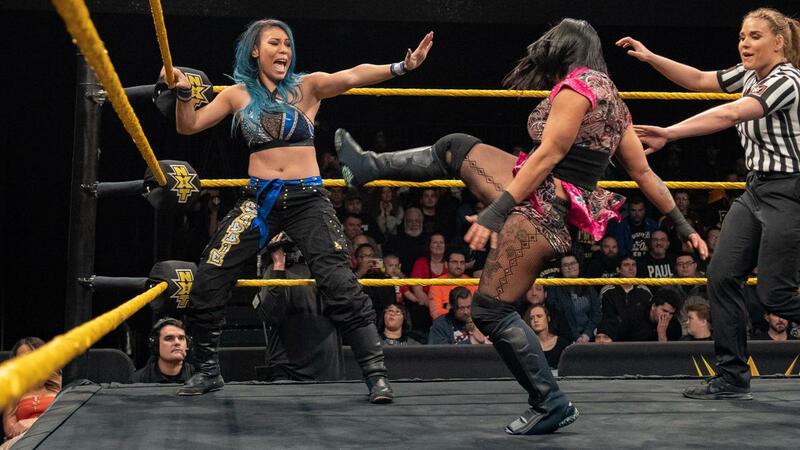 Mia connects with a shotgun dropkick, followed by a cannonball in the corner for a two count. Mia with a flurry of strikes, but Xia comes back with a flurry of her own for a two count. Xia to the midde rope but misses a kick. Mia then drops her with a spinning back fist. Mia then does a combination of Sole Food and Codebreaker, which Mauro says is called Protect Yo Neck. That gets the win. As soon as the match ends, The Horsewomen come out to attack Mia. Some of the PC recruits come out to brawl with them, but it ends up with a three on one attack on Mia in the ring. Duke and Shafir hold Mia up as Shayna drops her with a knee to the face. Shayna demands respect from Mia. K-Tank’s Take: I like the Horsewomen taking on everyone in the women’s division. In this instance, it helps legitimizes Mia, who I’m a big fan of. This match wasn’t that great, but sometimes there just isn’t chemistry. But Mia has a unique look and solid offense. It was announced later on that she’ll get to take on Shayna next week. We see Johnny Gargano warming up for his title match, and Candice LaRae shows up for support. She sees Tomasso Ciampa behind him and wants to know what he’s doing. Ciampa says that if Gargano needs him, he’ll be there. Gargano says he won it by himself and that’s how he’s going to do it tonight. All he needs, he already has, as he looks at his wife. Johnny says he’s going to be Johnny Freaking Wrestling tonight as they walk off. Ciampa says he’ll be watching. We now go to a sit down interview between Jeremy Borash and Matt Riddle. Riddle is asked if he was ever considering being more conservative when he came into NXT. Riddle says he got a piece of advice that you’d rather have someone tell you to tone it down than turn it up. He’s sure someone will tell him to tone it down at some point, but that’s not right now. He says he’s happy he got rid of Kassius Ohno because he was ruining Riddle’s good time. Now he can focus on what’s important. His goal is any championship that he can get his hands on and nothing is going to stop him BRO. There are 23 minutes left in the show as the bell rings. Let’s do this! Both men scrambling on the mat to try and get the advantage but Gargano ends up getting the ropes to get a clean beak. Solid chain wrestling by both men. Ciampa is shown in the rafters watching the match from above. We get to another stalemate in the ring and then Dream legitimately slaps the spit out of Gargano’s mouth and he has to go to the floor to regroup. Gargano tries for a test of strength once back in, but Dream goes to a side headlock instead. Gargano escapes, but gets dropped with a shoulder tackle. Dream with a little mind game as Gargano tries a drop down. Gargano ends up getting slapped again and then Dream comes off the top rope with an ax handle. Dream with a dropkick and is now in control. Gargano fires back with a couple chops but gets caught with a big boot. Dream tries to come off the top rope again, but Gargano sweeps one of the legs and Dream takes a hard fall to the mat. Gargano with a snapmare and dropkick to the back of the neck for a two count. Gargano now all over Dream with chops and punches. Gargano with a hangman’s neckbreaker for a two count. Gargano with a nice looking Rings of Saturn type submission. Gargano ties Dream’s arms up in the ropes as he continues to work the shoulders of Dream. Dream starts to fight back in the corner but Gargano whips him hard to the opposite side and Dream does the Flair bump over the top rope to the floor. Gargano with chops against the guardrail before throwing Dream back in and then locking on the abdominal stretch. Gargano tries a Rainmaker clothesline but Dream pulls Gargano in for a spinebuster instead. Dream drops Gargano with a series of punches and then a big boot followed by a clothesline that sends Gargano to the floor. Dream back to the top rope and another ax handle smash. Dream sets up for his twisting DDT, but Gargano escapes. Dream is able to counter back with a Fameasser, for a two count. Dream puts Gargano on the top rope and wants a top rope DVD, but Gargano slides out and tries a sunset flip powerbomb. Dream holds on, but Gargano ends up kicking the legs out. He then hits a spinning flatliner out of the corner for a two count. Both men get up and trade blows. Dream escapes a back suplex and then charges Gargano in the corner, who’s not looking, and ends up going backwards into Dream as they crack skulls and both go down. Dream ends up on the apron, but Gargano follows and superkicks him back in the ring. Gargano tries a slingshot DDT, but Dream punches him in mid air. Dream back to the apron and tries a DVD, but Gargano escapes and sends Dream to the floor. Gargano dives through the ropes and takes Dream out. Gargano tries his spear through the ropes, but Dream kicks him in mid air again. Dream sets up and connects with his spinning DDT this time, which gets a near fall. Dream to the top rope for a Purple Reignmaker, which his misses. Gargano with another superkick and gets a near fall of his own. Great sequence. Gargano slowly makes his way to the top rope but Dream cuts him off. Strong right hand by Dream and now he tries for the Super DVD again. Gargano with elbows but he can’t avoid it and Dream comes crashing down with him. Dream crawls for the pin and Gargano just kicks out for another great near fall. Dream back to the top rope and wants another Purple Reignmaker, but Gargano rolls to the floor. Dream decides to jump down on him again anyways, but Gargano catches him with a superkick. Gargano sends Dream into the steel steps, followed by a suplex on the ramp. He throws Dream back in the ring, slingshot DDT, but Dream somehow kicks out! Wow. Crowd definitely thought that was it. Gargano with standing crossface strikes, Dream comes back with a superkick, and then Gargano comes back with a lariat that turns Dream inside out. Dream is on his knees and eggs Gargano on for a superkick. Gargano charges him, Dream goes for a DVD, Gargano escapes and superkicks Dream. Gargano tries a tornado DDT, but Dream turns it into not one but two Dream Valley Drivers! He immediately to the top rope, he hits the Purple Reignmaker again, 1-2-3… New champion!! Full Sail is going nuts! After the match, we see Ciampa leave his perch, shaking his head at Gargano. Dream celebrates in the ring with his title as our show comes to an end. K-Tank’s Take: That last 10 minutes or so was a lot of fun. I’d probably give it right at 4 stars. The beginning was slow paced, but I loved Dream’s selling of his shoulders and back. He’s so good at everything he does. This was obviously taped before Gargano went to main roster, but I don’t know if that was planned before this title change, or if they knew they were going here to continue Gargano vs. Ciampa. There were two finishes filmed at Full Sail when this was taped, so maybe they had a couple different directions they were ready to go, in case the main roster thing happened. It’ll be very interesting to see where Gargano and Ciampa go from here. Huge congrats obviously go out to Dream with his first title win. He’s so young and so good, this is just the first of many. That’s it for this week. So until next time, don’t do anything I wouldn’t do… but if you do, name it after me! Believing you are absolutely everything you say you are is necessary if you want to be a champion. …backing it up is what ACTUALLY makes you one.